Nine people were Injured, four critically. Nine people were injured, including three who are in critical condition at Bridgeport Hospital, after a blaze at the Westwood Apartments at 140 Kane St. in West Hartford in Thursday and the American Red Cross has provided help for 35 fire victims. Firefighters rescued several people who chose not to evacuate from the fire that broke out on the second floor at 2:16 a.m. and some were rescued from their balconies. Had they evacuated when the alarms went off rather than go back to bed, they would not have had to be rescued, officials said. Emergency crews also rescued animals. One of the who was taken to the hospital as a precaution is a Hall High School student. "I couldn't see anything. I was about to fall from the stairs and the fire department helped us. That was really nice of them. They picked up the kids and we just got out from the house. All of the smoke, everything went inside the house,"Razia Babajan, a mother of three, said. The residents who were taken to the hospital sustained smoke inhalation and respiratory burns, officials said. At one point, flames were shooting from the Oakwood Avenue side of the building and mutual aid from Hartford and Newington was called in to assist. Firefighters said the fire spread the way it did because there were no sprinklers in the building. This building was renovated about 15 years ago and we attempted to get sprinklers in this building and the owner applied for a modification," fire chief Gary Allyn said. "(I)f we had sprinklers, we could've contained it to that one apartment." Around 100 people are displaced and officials from the American Red Cross said the fire department told them that residents will not be able to go home last night. Three units are uninhabitable and crews have to restore electricity and fire alarms before residents can return. 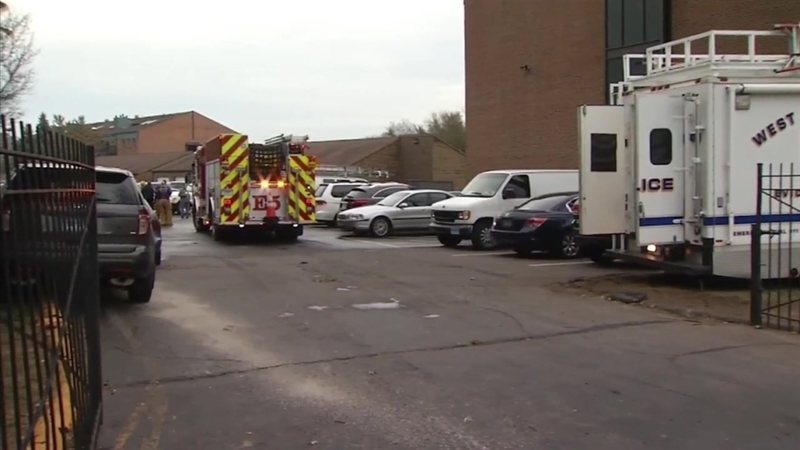 A shelter was open at the Elmwood Community Center until 8 p.m. on Thursday to help residents impacted by the fire and an ambulance transported one person from the shelter to the hospital on Thursday aftermoon. The Red Cross provided lunch and dinner, as well as beverages and snacks, throughout the day. They offered help to 15 families, including 23 adults and 12 children, after the fire. All residents displaced by the fire should visit the shelter at some point, even if they have a place to stay for the night, to talk with Red Cross case workers to find out what assistance they might qualify for.